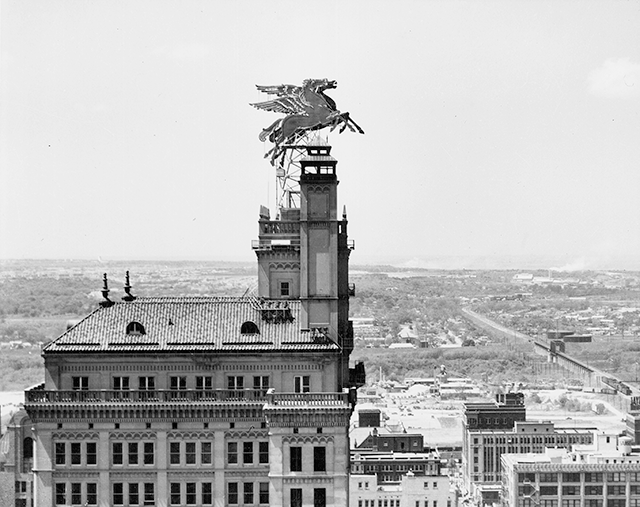 Atop the 29-story Magnolia Hotel in downtown Dallas stands a replica of the famous Pegasus sign installed in 1934 by the then Magnolia Oil Company. The “Flying Red Horse” was their corporate symbol and was installed on the roof of their headquarters for the 1934 American Petroleum Institute Convention in Dallas. 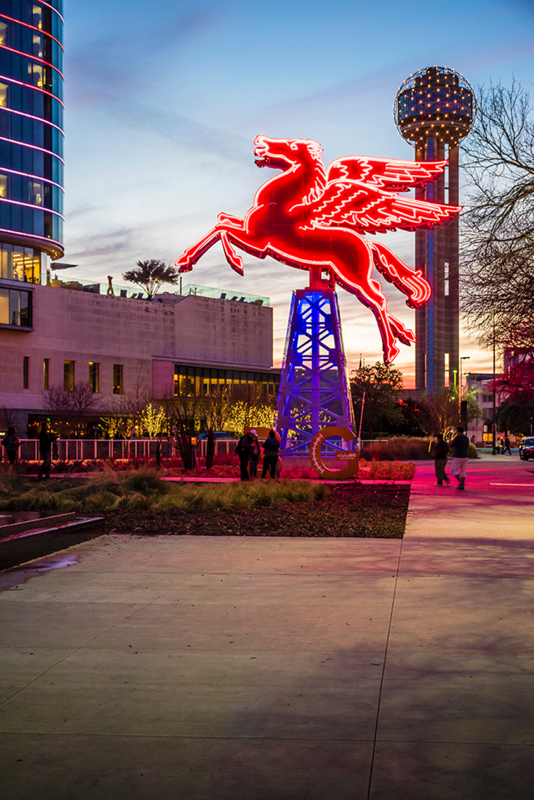 Once installed, the Pegasus quickly became a symbol for Dallas because of its visibility from miles around, especially when lit up at night by its red neon. The Pegasus remained on the roof of the Magnolia building until the late 1990s. By that time it was in rough shape with broken neon tubing, rusted and damaged panels, and a platform that no longer rotated. An effort was undertaken to replace the worn-out sign with a replica though private donations in time for the new millennium. On January 1, 2000, the replica was officially lit, bringing the Pegasus back to life. After removal, the original Pegasus was pretty much forgotten until a conversation between Jeremy McKane and June Mattingly, Wineburgh’s daughter, about the lost sign. McKane was hired to help coordinate the art for the new Omni Dallas Hotel and as he listened to Mattingly, he became fascinated with locating the original Pegasus. McKane shared his quest with Jack Mathews and Jeff West of Matthews Southwest, developers of the Omni, and they decided that the sign needed to be found, restored, and returned to downtown Dallas. It was quite an undertaking to locate the sign, which was squirreled away in a city-owned shed. When discovered, Matthews Southwest committed to funding its restoration and installation in front of the Omni. The porcelain enamel panels were painstakingly restored by local art restorer Michael van Enter, new neon was installed, and a replica “oil derrick” was created by local artist Tony Collins for the Pegasus to rest upon. 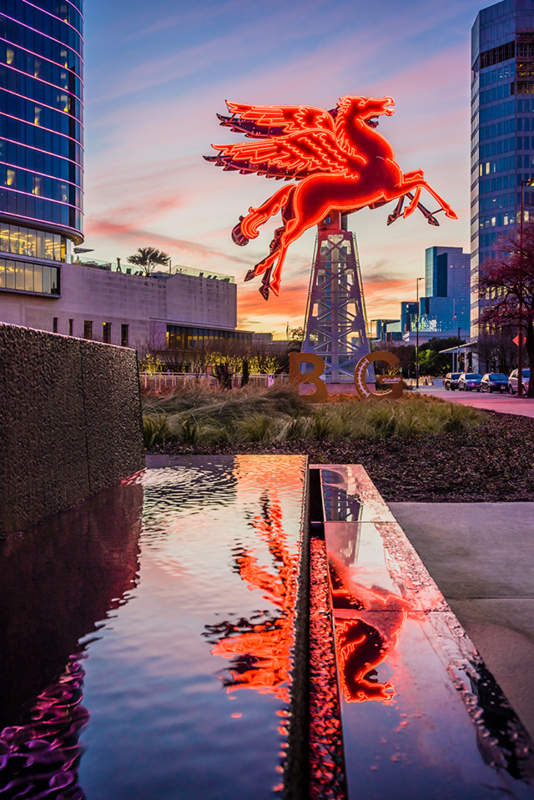 On May 27, 2015, the neon of the newly restored sign was officially lit up and the Pegasus came to life as a new piece of art for downtown Dallas. 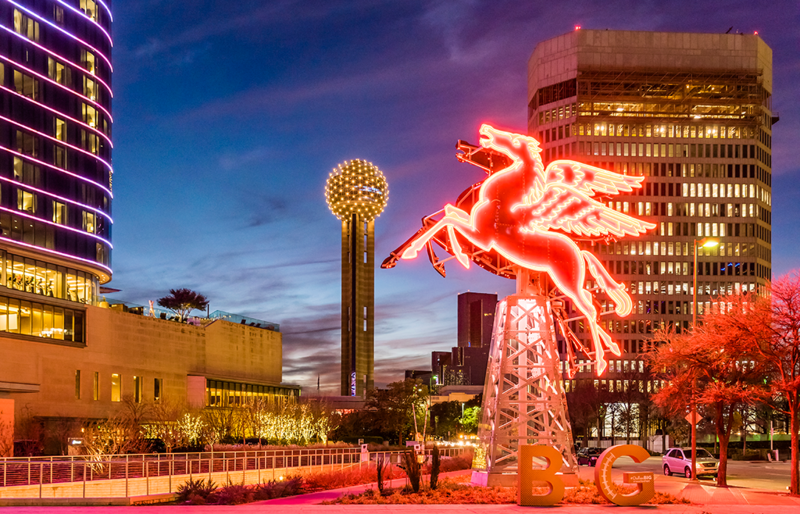 The original long-time beloved symbol of downtown Dallas has returned, albeit at a much lower elevation, and now Dallas can be considered a “four-horse” town!